No need to solder any header or wire, just stack RPi-DAC-RCAplus on top of the RPi B+. 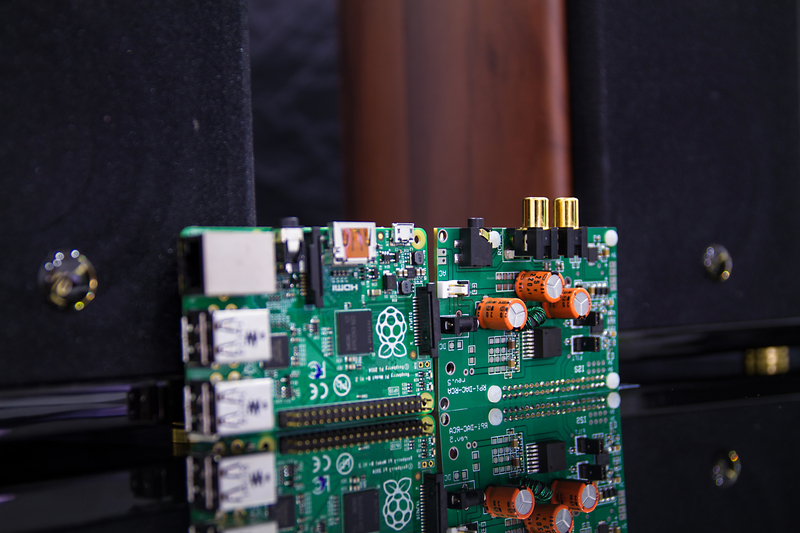 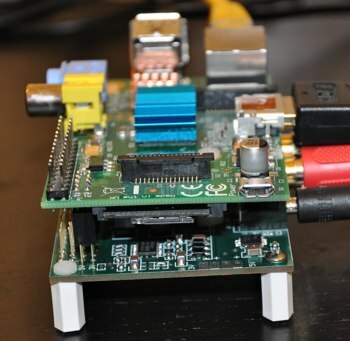 Stack vertically, RPi-DAC-RCA is on top of the RPi B+. 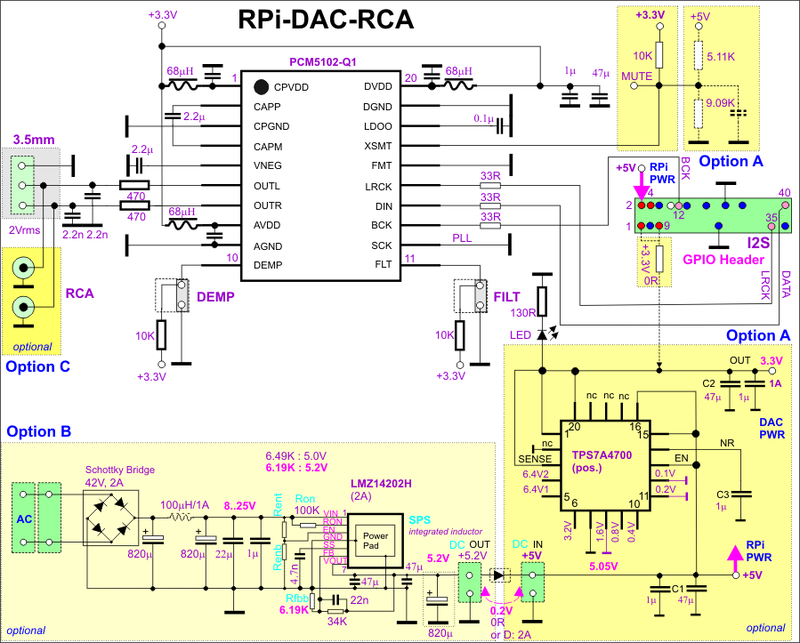 RPi-DAC-RCA could be stacked also below the RPi B+, it needs a bit of soldering effort (extend RPi B+ GPIO header pins, use a different 2x20 female header on RPi-DAC-RCAplus). 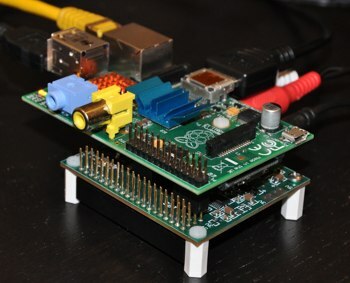 This can give you a smaller height of the system. 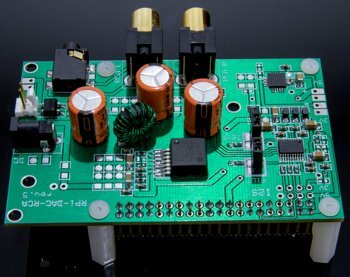 Use the options in order to improve sound quality (e.g. 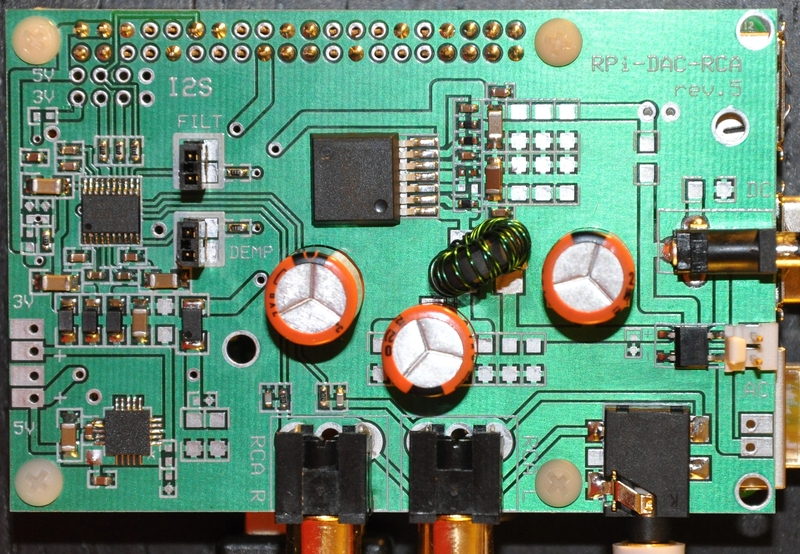 very-low-noise LDO or SPS with 2A current capabilities). 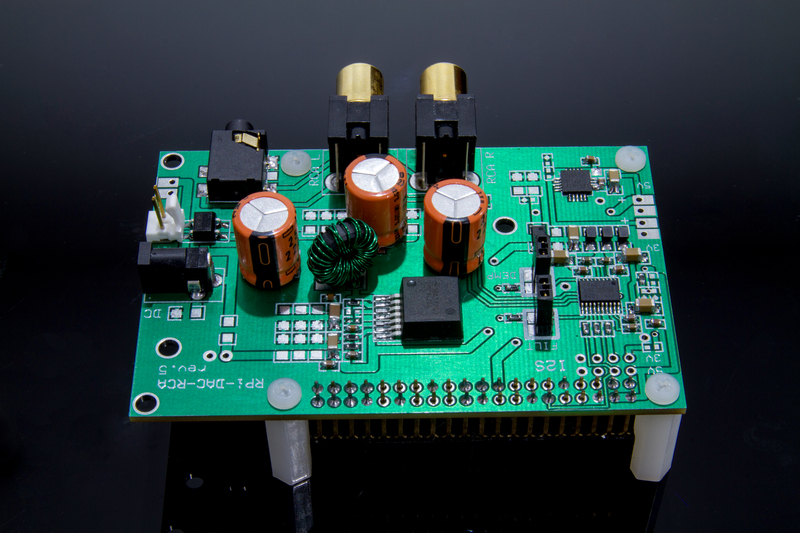 The power input can be AC (from secondary AC transformer output) as well as DC with a wide voltage range of 9..15V. 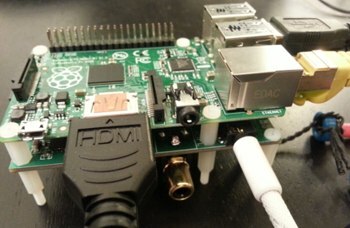 You can use a DC wall adapter, e.g. 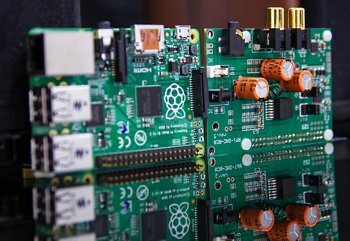 9..15V, 1.5..2A. 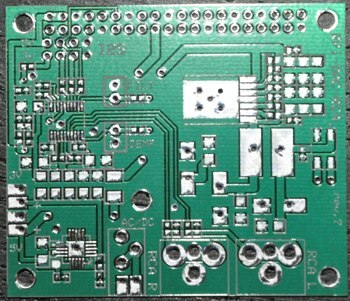 There is a DC plug on PCB. It provides enough power to feed also extension boards. 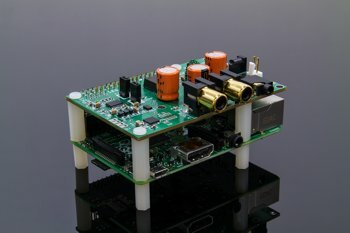 The soft-mute feature (XSMT) can be used in order to watch the main power supply rail. 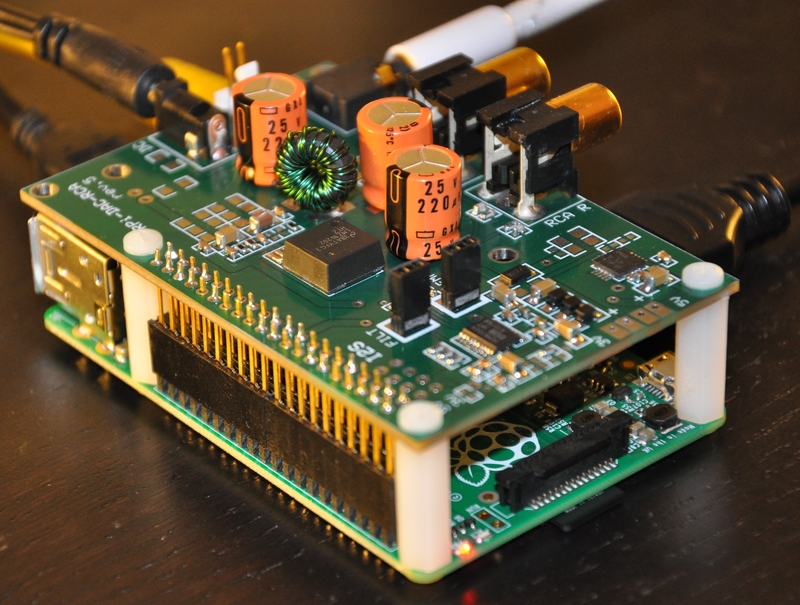 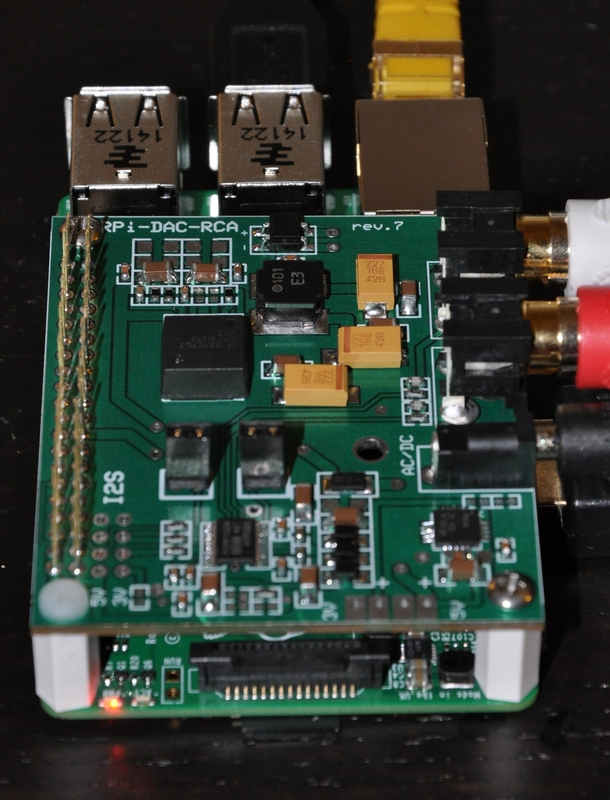 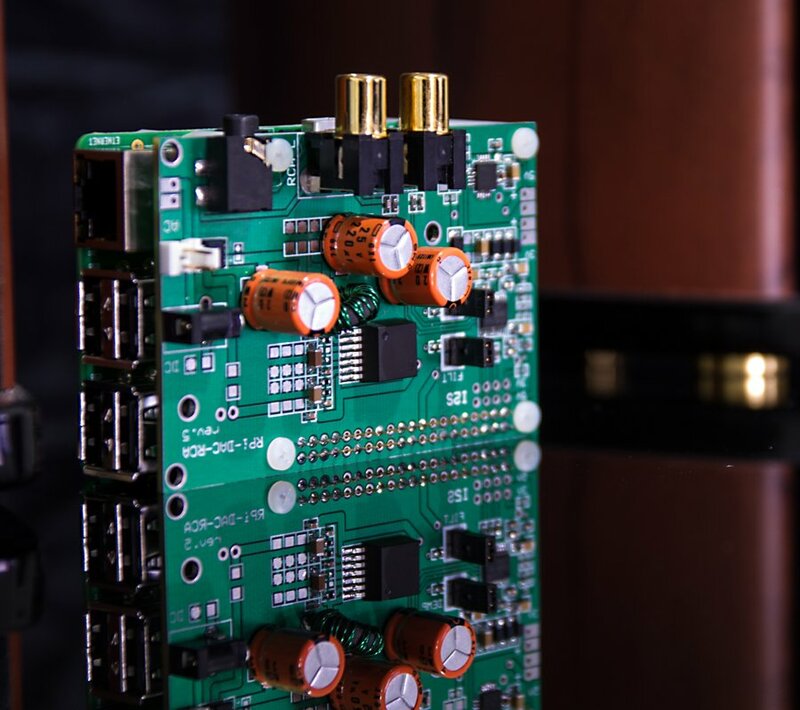 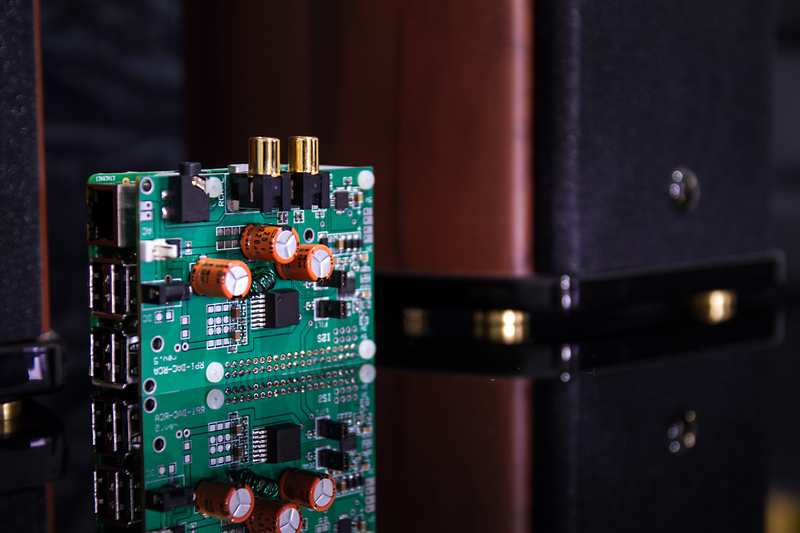 The DAC PCM5102 runs in PLL mode, no SCLK signal needed (which is not provided by the RPi). 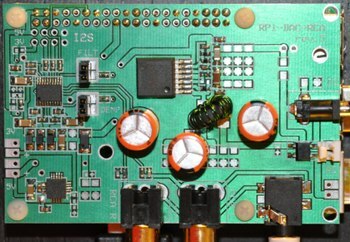 The output signal is provided on a 3.5mm stereo jack or dedicated RCA connectors (Option C). 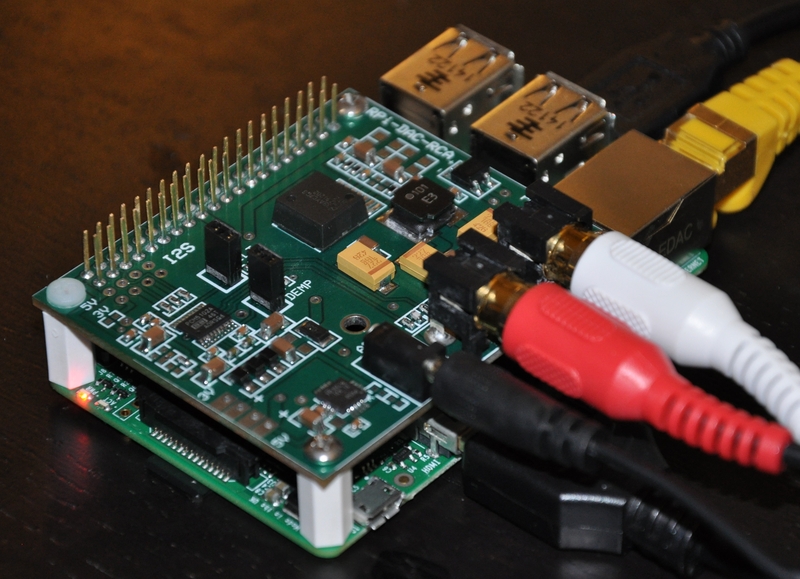 Remark: even with SPS soldered, it is possible to let it unpowered (no AC) and to power the RPi still via USB power supply. A diode allows to use the USB power supply still on RPi B+. 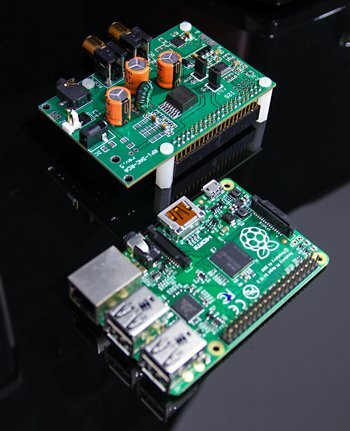 BUT: never use both active at the same time. 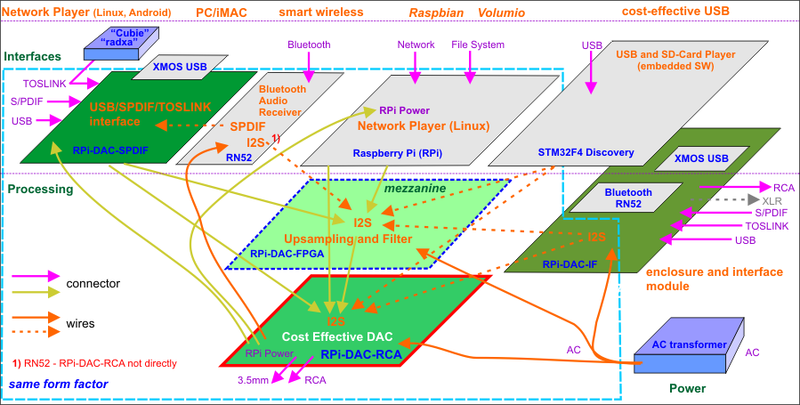 If you think anything necessary to change on your running system (Rasbian, Volumio) - NO! 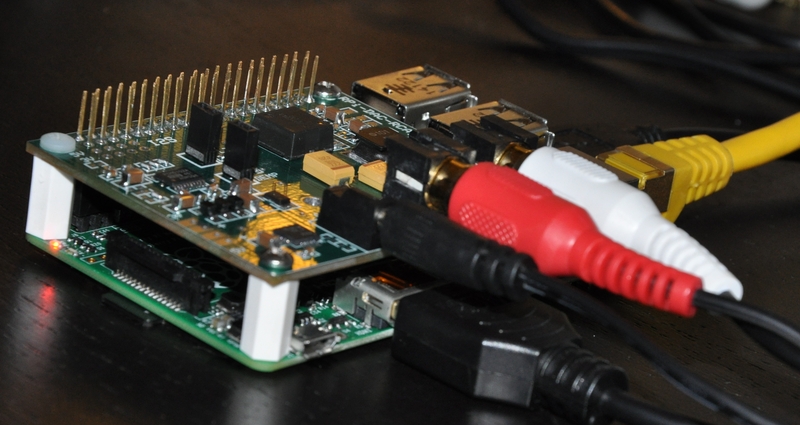 Just change the HW module, use still the same driver (RPi-DAC or HifiBerry) and setup - and it works. 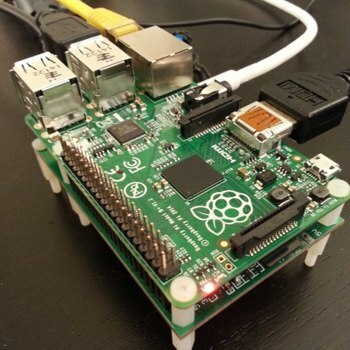 Important:The Rasbian Linux for the RPi B+ needs a modified kernel module (different I2S pin configuration). 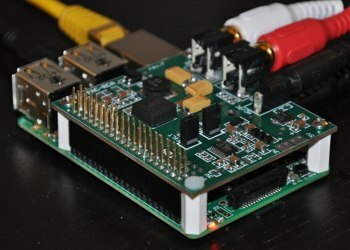 Please, get a patch for the older kernel or use really a Rasbian image which supports the B+ I2S. 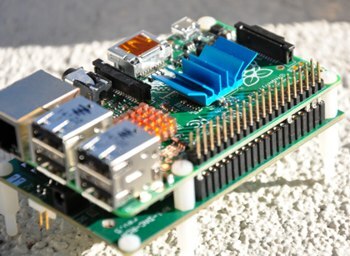 The Rasbian Linux for the older RPi B does NOT work. 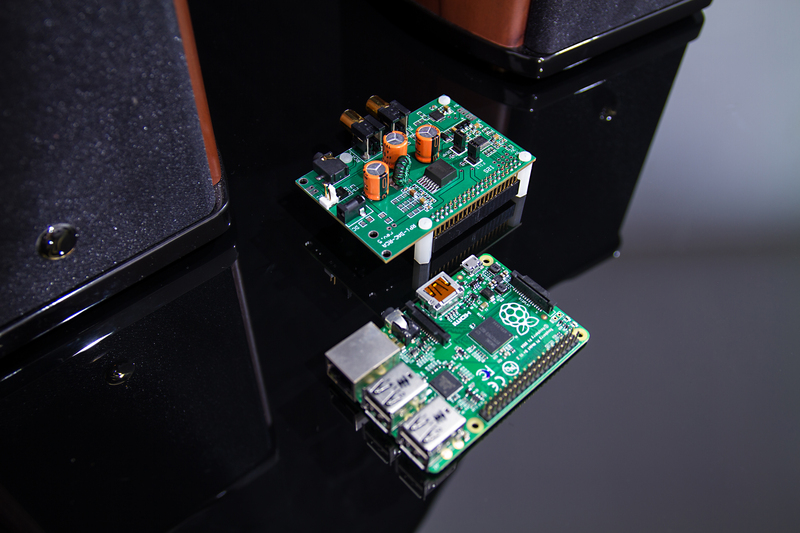 You can change anytime from HifiBerry to RPi-DAC-RCAplus without changes on your system. 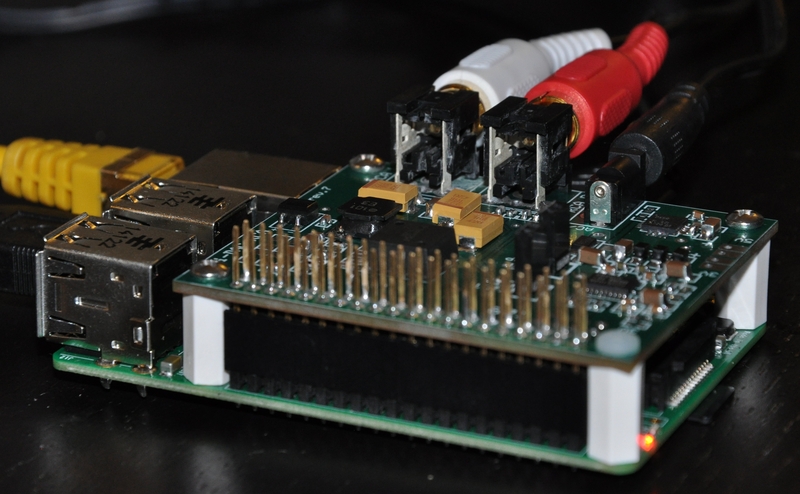 You can upgrade (solder additional parts) any time later on Standard RPi-DAC-RCAplus, e.g. 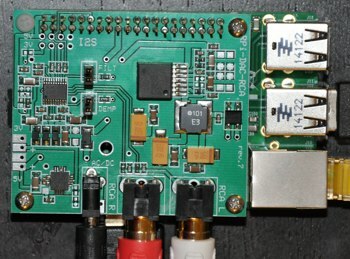 add the SPS and any AC/DC input, having 1A current left for your extensions. 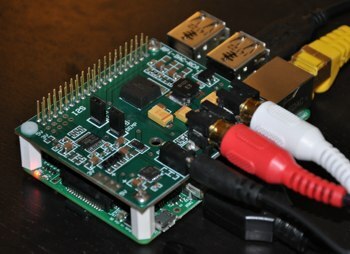 So, you can run the RPi-DAC-RCAplus even with the RPi-DAC drivers and change anytime to the RPi-DAC later without any modifications. 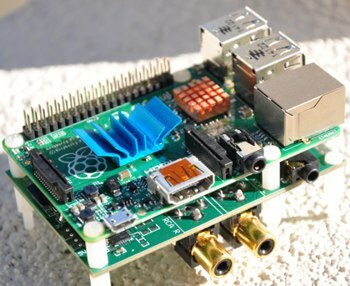 Same size as Raspberry Pi, possible to mount on top (with GPIO connector with long pins) or below RPi (needs GPIO pin extensions soldered). PCB can support older RPi B as well as newer RPi B+ (larger GPIO connector). 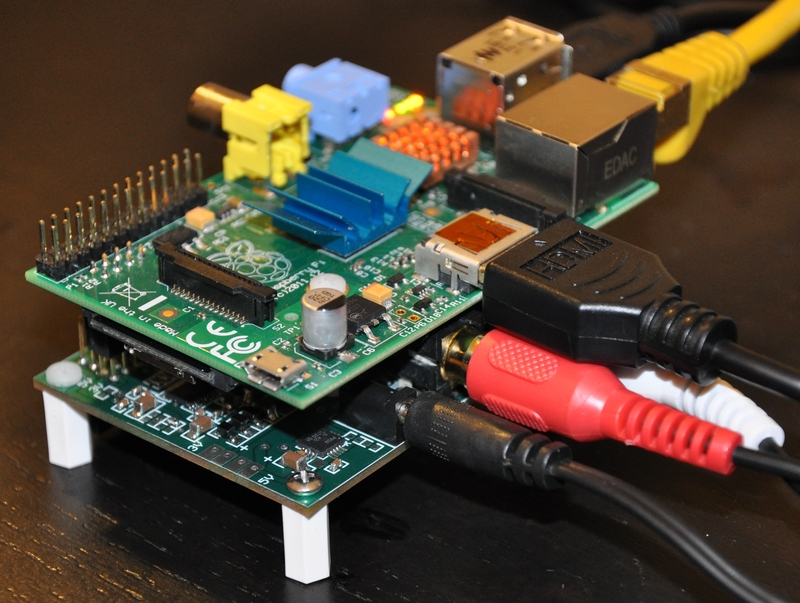 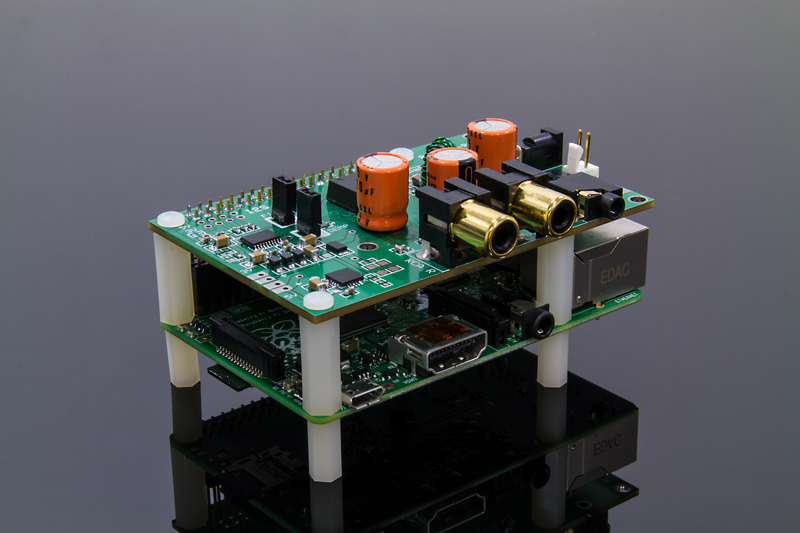 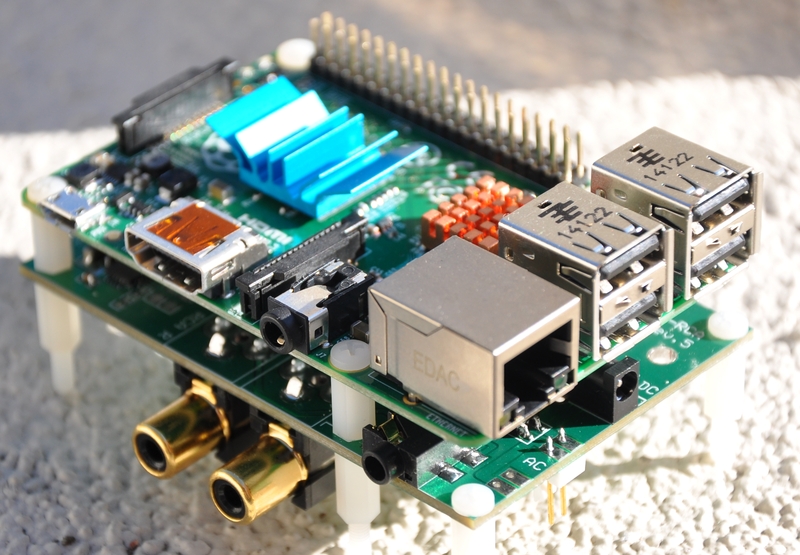 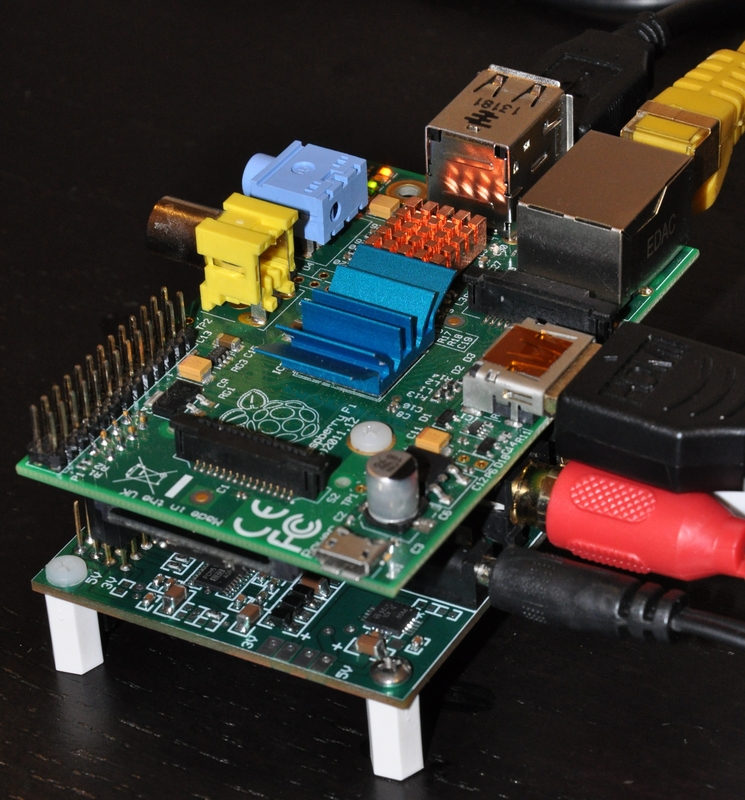 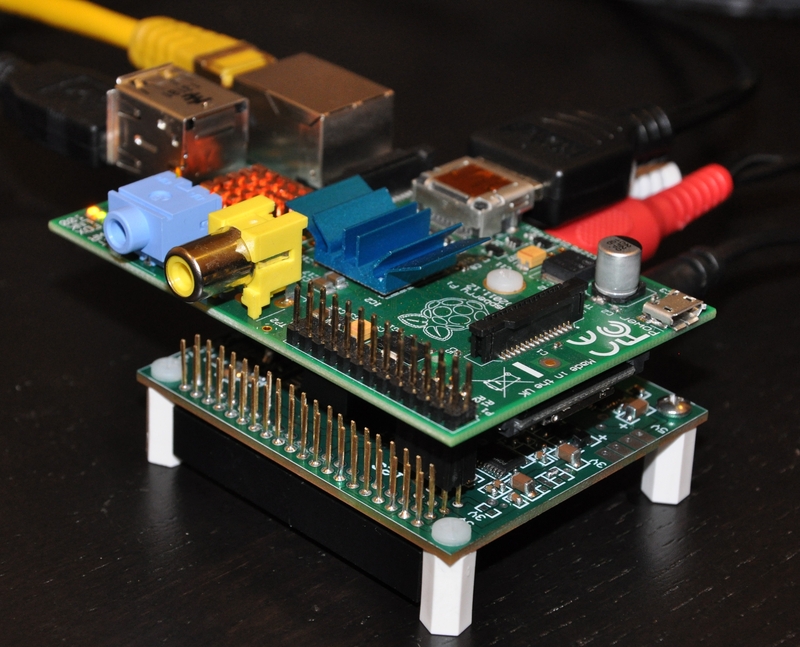 Smaller PCBi, RPi-DAC-RCA_Bplus_Short so that it fits on top of new Raspberry Pi B+. 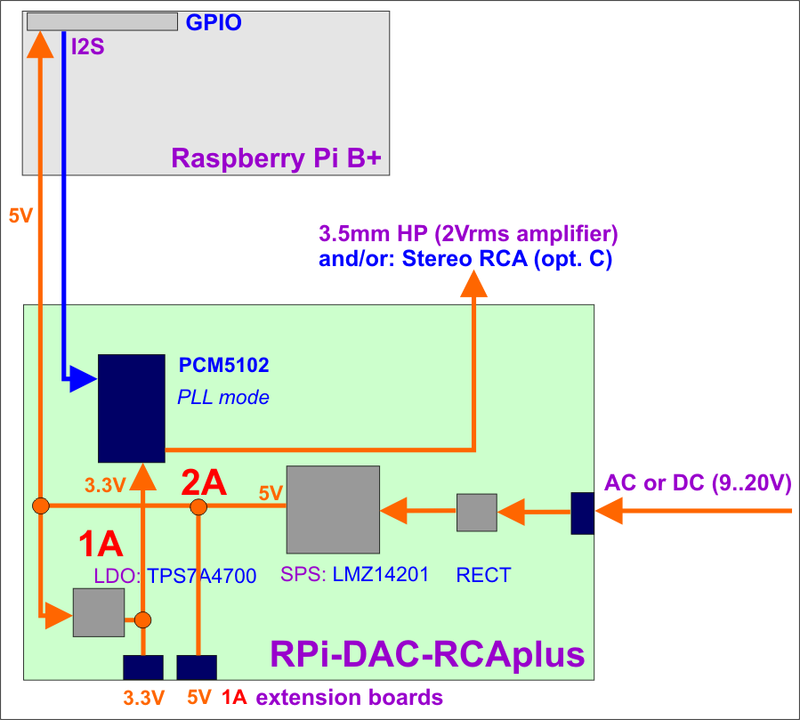 Possible to use the GPIO for additional extension boards. 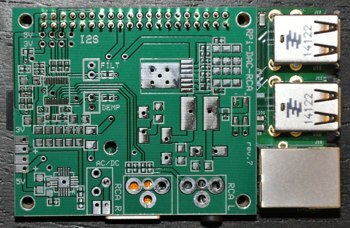 PCB can support older RPi B as well as newer RPi B+ (larger GPIO connector), just one standoff for older RPi B. 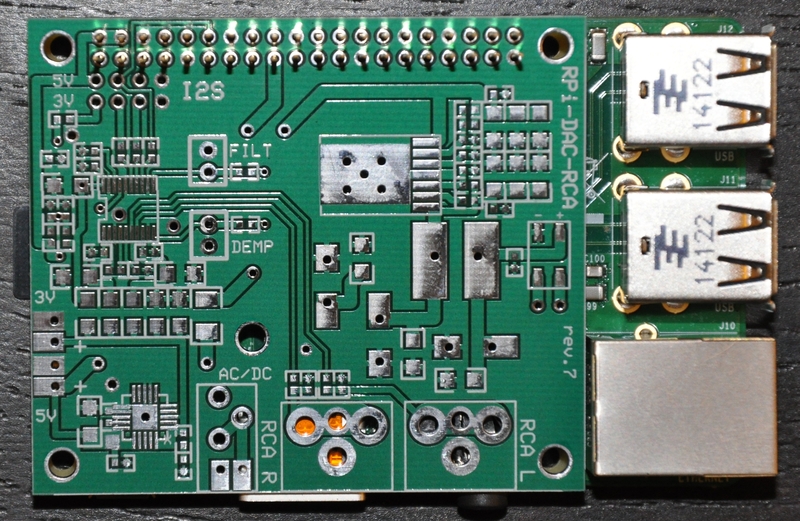 Smaller PCB so that it fits on top of new Raspberry Pi B+. 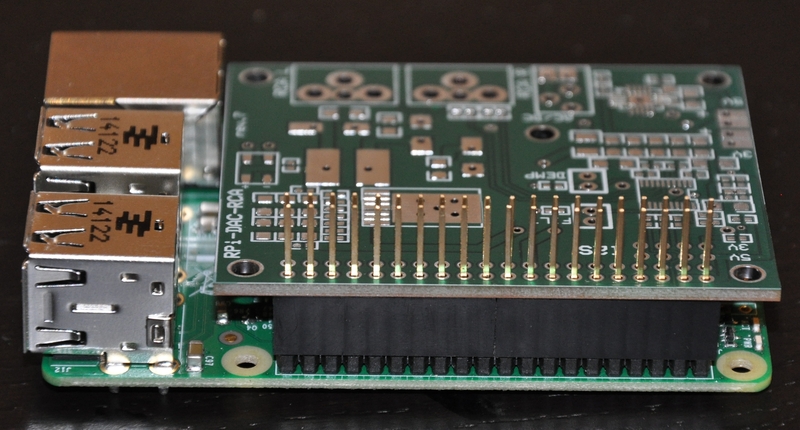 Possible to use the GPIO for additional extension boards, extend via GPIO pins, stack other boards. 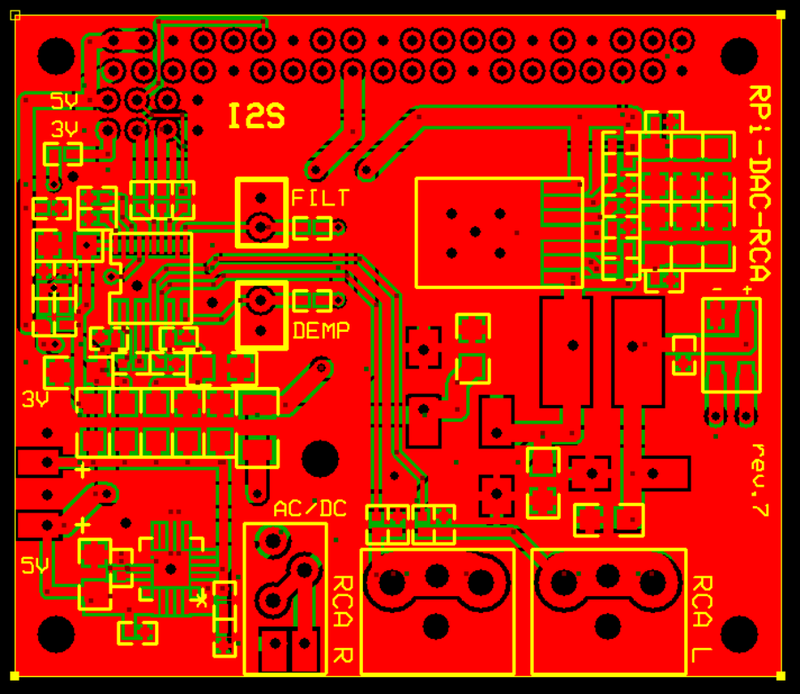 Smaller PCB so that it fits under the recent Raspberry Pi B. 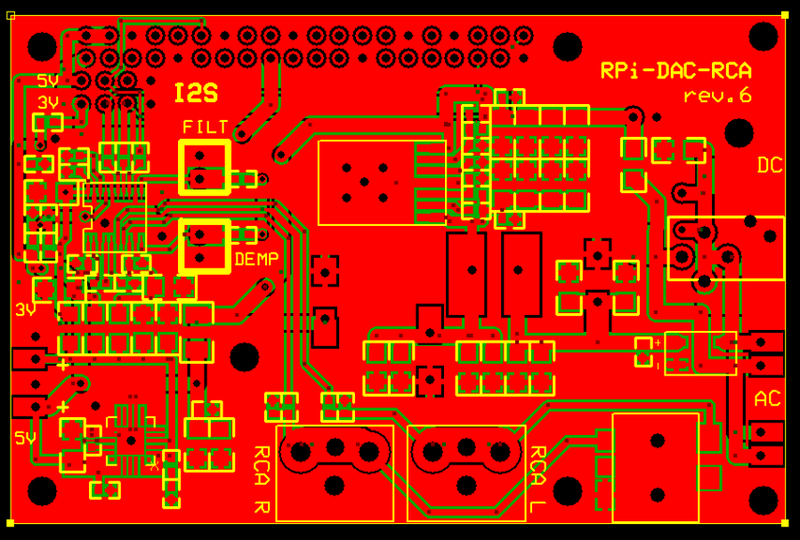 Same PCB as used for RPi B+, one PCB for both RPi versions. 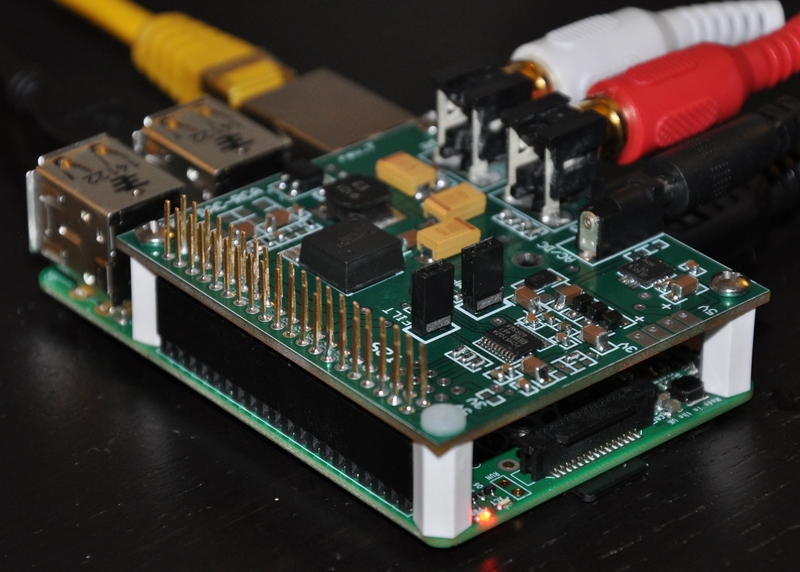 It uses the P5 I2S header, the GPIO for B+ is not used. 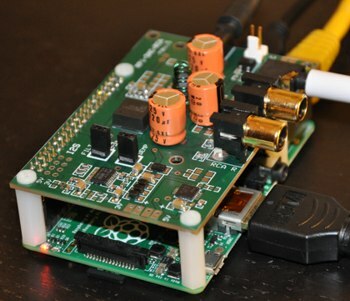 You can use almost all other RPi-DAC, T-DAC modules, even stacking with RPi-DAC is possible. 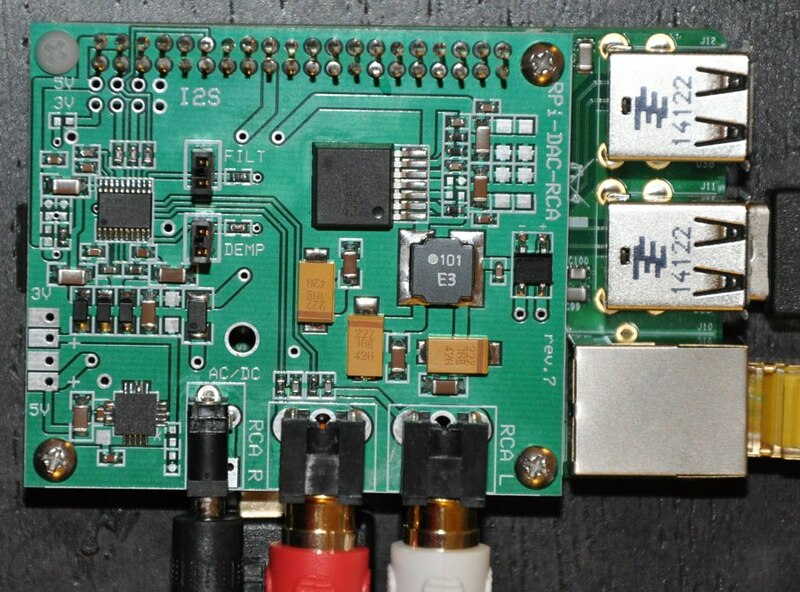 Exception: the RN52 Bluetooth module does not work directly on DAC PCM5102A, just on RPi-DAC with PCM1794A. You can use Bluetooth via RPi-DAC-SPDIF or RPi-DAC-FPGA module (with modified FPGA project). 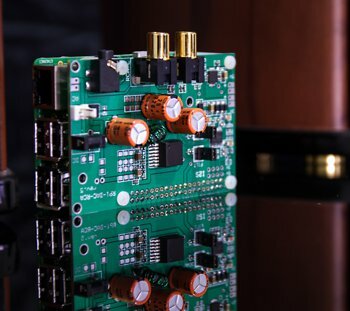 Almost all modules can accept AC and have on-board rectifiers. 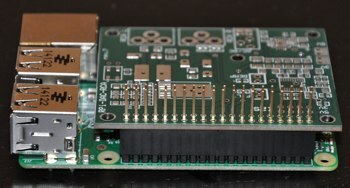 Some boards can be powered via DC direct connector without wiring (e.g. RPi).